A technology revolution is coming, and the University of Delaware is on the leading edge as the recipient of a $1 million grant from the National Science Foundation to help develop the quantum electronics of the future. The funding is part of $31 million in quantum research projects announced Sept. 24 by NSF Director France Córdova at a White House summit on quantum information science. Shown here is a device made in the University of Delaware’s Nanofabrication Facility. An Indium Arsenide quantum dot, depicted in yellow, serves as a container that holds one electron in this tube-like waveguide. The electron’s spin, which can be controlled by both light and electric fields, will serve as the basis for quantum computing. The research is supported by the National Science Foundation. Many of today’s technologies rely on the interaction of matter and energy at extremely small length scales. Quantum mechanics studies nature on such a scale — many thousands of times smaller than the width of a human hair — allowing researchers to observe, manipulate and control the behavior of particles. Next-generation technologies for communication, computing and sensing will exploit these interactions with potentially profound benefits. “The power of quantum science is that it offers totally new ways to develop electronic devices — from computers to medical sensors — with the promise of processing information faster and with greater accuracy and security than ever before,” said Matthew Doty, associate professor in UD’s Department of Materials Science and Engineering and lead investigator on the project. This new age of electronics will operate on a completely different set of rules than today’s computers and smartphones. As Doty explains, today’s electronics are based on data encoded in bits. A bit is the smallest unit of information, and it exists in one of two states: 0 or 1. In the hardware of traditional electronics, the 1 state is represented by a high voltage, say 5 volts, and the 0 state by no voltage. Transistors manipulate these bits, for example, flipping the state of bit A if bit B is in the 1 state, but leaving bit A alone if B is in the 0 state. Now, let’s consider quantum devices. They are based on quantum bits, also called qubits. Weirdly enough, these qubits can exist in “superposition states” that are a mixture of both 0 and 1 at the same time. This would make a quantum computer essentially capable of processing many possible scenarios simultaneously instead of just one at a time. The potential of quantum computing has been known for decades, but scientists face two extremely difficult fundamental challenges in building the hardware for quantum computers with thousands of qubits, Doty said. First, because the superposition states of the qubits are so fragile, they can “collapse” due to interactions with the atoms in the environment around them. Somewhat like creating the perfect kitchen for a restaurant where the specialty is soufflés, the entire computer architecture has to be built to extend the life of the superposition states and perform operations faster than the qubits collapse. Second, while conventional computers have tools to deal with inevitable errors, quantum computers can’t use such tools because each qubit state is a little bit different. Amplifiers in today’s computers, for example, can be used to push a 4-volt signal back up to 5 volts because the hardware knows 4 volts must still correspond to a bit state of 1, Doty said. But such a tool would destroy the fragile superposition states in a quantum computer. 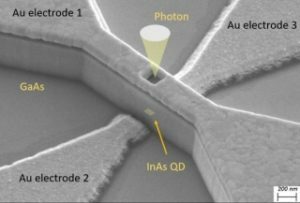 Doty will lead a research team from UD, Virginia Tech and Stanford in exploring a new approach to making a quantum device. Their approach is based on “inverting the design paradigm.” Instead of trying to create thousands of identical qubits — a nearly impossible task — they are redesigning the hardware so that each qubit is tunable from the get-go. The researchers are using gallium arsenide, a common semiconductor material, as their platform. Embedded within the gallium arsenide will be indium arsenide quantum dots, each about 10,000 times smaller than the diameter of a human hair. Each quantum dot is like a teeny container that can hold a single electron. The spin of that electron, pointing up or down, will be the logical basis (0 or 1) of the qubit. The interactions between the qubits will be controlled by light propagating in tube-like waveguides on a chip. In addition to Doty, the UD team includes Joshua Zide, professor of materials science and engineering, and Stephanie Law, Clare Booth Luce Assistant Professor of Materials Science and Engineering. Zide is an expert in growing the gallium arsenide crystals that serve as the foundational material, and Law has expertise in developing semiconductor meta-materials that will be used to create the waveguides. At Stanford, Jelena Vuckovic, an expert in photonic devices, will develop the new structures for the waveguides. And at Virginia Tech, Sophia Economu, a theorist in quantum information science, will design the algorithms needed to make the device operations work. All of the device fabrication will be done in the UD Nanofabrication Facility, which Doty directs. This so-called “machine shop of the 21st century,” which opened in 2016, provides world-class capabilities for developing technologies at the atomic level. It’s already a bustling place, with dozens of academic and industry users, and destined to get much busier as “quantum” moves into everyday parlance — and more deeply into the academic curriculum. Complementing the research, the team is planning a summer experience in quantum science for a dozen underrepresented high school students. 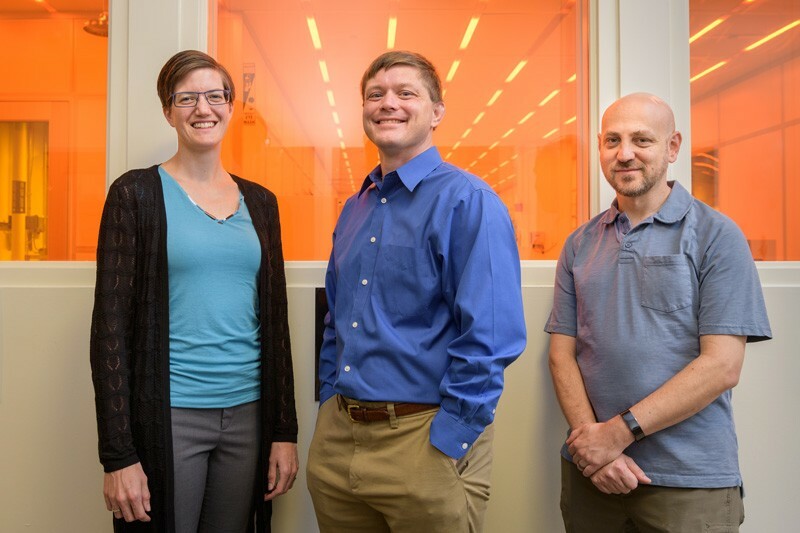 Slated to launch in 2020, the two-week program will engage students in making actual quantum devices in UD’s Nanofabrication Teaching Lab, offering an exciting introduction to a new field that will drive the workforce of the future, Doty said.